Dead center of the lobby of the Indiana State Museum’s IMAX stood a vintage Tron arcade game. Set there for a theater promotion, its cathode-ray screen beckoned with crudely-animated grid bugs and lightcycles. Its quarter slot (it was still only a quarter!) expectantly hung open hoping to sate two decades of hunger. I slipped in my two bits. As the 8-bit rendition of Wendy Carlos’ Tron soundtrack blared its familiar fanfare, I was transported back to my freshman year of college, when I’d spent entirely too many lonely afternoons in the Ball State student union arcade battling the Master Control Program. For all I knew, this could have been the very same machine. While that was certainly the highlight of my roadtrip to Indy to see Tron Legacy in IMAX 3-D, the movie was pretty good too. It’s true that you can never again go home to the game grid, but you can at least visit for a spell. I was surprised that Legacy was so much of a proper sequel, given that the vast majority of its intended audience has likely never seen the original. The storyline directly builds upon the events of Tron, with Jeff Bridges’ character Kevin Flynn becoming trapped in the digital world when his attempts to “perfect” the system run up against a bit of bad code in the form of his computerized avatar CLU. There are numerous nods to the Tron faithful. For example, Flynn’s rebellious son Sam lives in a converted garage bearing the name “Dumont.” In the original film, the late Barnard Hughes’ character Dumont claimed to have started the Encom corporation in his garage. It’s a nice bit of continuity, but it also tells you a bit about Sam’s character and his feelings about the company he has inherited. Similarly, when Sam is being prepared to play gladiatorial games on the grid, a voiceover explains the rules regarding the Frisbee-like “identity disc” that all inhabitants of the digital world wear. It’s word-for-word the same speech that the villain Sark made to new conscripts in the original, suggesting that all Flynn’s efforts to reform the system have merely resulted in recreating the corruption of the Master Control Program. Of course, Legacy is also something of a remake in that it follows the same basic plotline of its predecessor: a human is sucked into the computer, forced to play deadly videogames, and must make his way across the “Sea of Simulation” to enter the portal leading back to the real world. One major difference is that the stakes are considerably higher. CLU’s ambition is to bring his perfection to our world by physically leading his forces through the interface. Obviously, you don’t want to think very hard about the mechanics of this. While, as I expected, the CG employed to recreate the digital domain doesn’t break any new ground, I was blown away by the de-aging effect applied to Jeff Bridges for his dual role as CLU. There was only one shot that was any less than completely convincing. The implications for aging actors are staggering. Anne Hathaway needs to have herself scanned ASAP; she can continue to play rom-com roles against digital Jon Hamm well into her eighties. The cast is largely good. Besides the ever-engaging Bridges, there’s Olivia Wilde as a credible action heroine and Bruce Boxleitner making a welcome return. However, it’s Michael Sheen who completely steals the show as the David Bowie-like nightclub impresario Castor. Ironically, I didn’t care so much for the 3-D. Perhaps I was sitting too close to the screen, or my new bifocals were interfering with the process. I just didn’t get the same effect that I did watching the preceding trailer for an upcoming nature film about baby animals; those monkeys really seemed inches away. 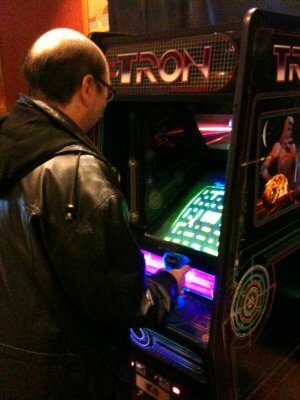 All in all, however, I was satisfied with Tron Legacy. I hope that it does well enough to justify future installments. I like this world, and think that there’s more story left in it.